Today, Jacob would probably be sent to a sleep lab, to see if apnea is causing his frequent midnight disturbances. One night he wrestles with an angel and wakes up with a dislocated hip. In today’s account he sleeps on a rock and has wild dreams. In other cultures people really do use rock hard pillows – they were traditional in China, and carried sacred and life-giving connotations. Not long ago a woman described learning to sleep on an antique jade pillow – it only took three days, she says, and improved her spiritual and emotional health. The pews here may not be stone, but I’ll warrant they’ve been hard pillows for 175 years of sermons. 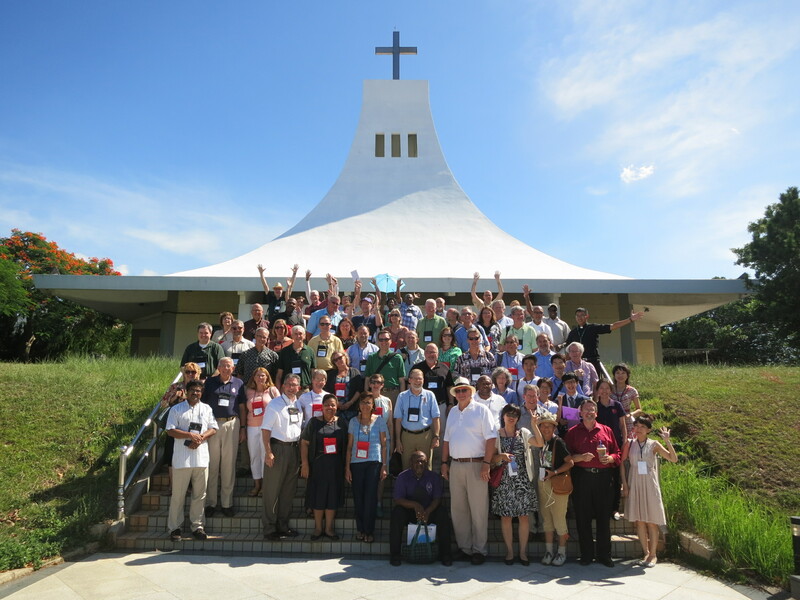 After a lot of lost sleep and plenty of jetlag last week, most of The Episcopal Church’s bishops met in the Diocese of Taiwan– the first time they’ve ever met in Asia. Many were able to visit Advent Church outside Taipei. The diocese is only 60 years old, and the church newer than that, and it’s built in the shape of a stylized mountain – perhaps a volcano. There is a remarkable stained glass installation over the altar – like a blue and gold window into heaven. From the peak hangs a sculpture called Jacob’s Ladder, with little rungs that remind you of a gate. The German architects who designed this church used different imagery, but the spires on your roof and the fretwork on these beams (which just might suggest a ladder!) and the windows dedicated to heroes of this community are all meant to draw us into awareness that we also stand at the gate of heaven. Jacob is surprised about that: “Surely the Lord is in this place – and I did not know it!” Most of us are surprised when we discover God’s presence in unexpected locations. The bishops met in Asia to learn how Episcopalians and other Christians discover God in different contexts. That wondering awe and awareness are central to our journey – whether climbing Jacob’s ladder, wandering in the wilderness, or in encounters with new people and strange places. There have always been people who believe that God is only available or accessible in one place, whether it’s the tent that housed the Ark of the Covenant, the Temple in Jerusalem, the altar of a church, or the shrine in Mecca. All are places of encounter with the holy – and they are also icons, windows into the divine. None of them is the fullness of God’s presence; they point to God. The scrum of daily life and the noise of the marketplace still keep us from waking to the near presence of the Holy One. Have you seen the hand of God in the wondrous midnight blue of the sky after sunset or the fuchsia-painted sunrise in the last few days? Have you searched for the image of God in the face of a neighbor? Do we expect to meet Jesus in the poor? Are we willing to climb up out of the static and chaos of life to find the Spirit creating something new? Christ Church exists to help us all wake from slumber. It might even involve taking a nap here, if we can remember to rest a while in the palm of God’s hand. There is a reason why this is called a sanctuary (it even says so on the steps outside your door!). Stop a minute and notice the miracle of breath – breathe in life-giving spirit and give thanks; breathe out fear and anxiety – and rest in God’s embrace. This community has endured for 175 years because it continues to awaken people to the reality of God at work in their lives and in the world, and continues to prod them to go out and rouse others to realize the power and possibility of healing the world God has given us. This sanctuary is an image and an icon of the sanctuary that God intends for the whole world. This church’s first building here in Holly Springs is now a shrine to those who died caring for yellow fever victims in 1878. Slave traders brought yellow fever to this continent along with their human cargo from West Africa, and the first epidemics erupted in North America in the 1600s. Ebola is this age’s yellow fever, and it’s migrating across West Africa right now largely because of fear and endemic poverty. The yellow fever martyrs were fully awake to the suffering around them. The world is just beginning to awaken to that suffering today. If you want to help, Episcopal Relief and Development is among those who are responding – providing medical supplies, teaching about transmission and prevention, and distributing food. Christ Church is a community for awakening the world. Irenaeus famously said that the glory of God is a human being, fully alive. That’s your task here – to rouse this community to the fully alive, risen life of Jesus’ friends and disciples, and to dream God’s dream for healing, restoration, and reconciliation. What would it take to prompt cries of hosanna here? The food pantry and garden café are wide-awake responses to the fact that nearly half the residents here live below the poverty line. This is the second poorest community in Mississippi. What other wake-up calls are needed? I gather you’re also involved in housing and homelessness here. Imagine a city and county where every person had found a sanctuary, a home in which to dream dreams of wholeness and sleep in peace! Jacob’s dream includes the promise that all the people of the earth will be blessed by him and his descendants. We share that legacy, if only we will wake up and claim it. Pray that the people of this land and this community will be blessed by who you are, that people will be healed of their blindness and deafness to the suffering here and around the world. You have a goodly heritage in this place – stay awake, prod the people around you to be alert to the near presence of God, and you will hear cries of hosanna. Truly this is the gate of heaven! For through you Christ’s Church is indeed meant to bless the world for years and centuries to come. When the congregation outgrew it, it was sold to the Roman Catholics. The present building dates from 1858.